I was engaging in my usual wake up activity, browsing Twitter on my phone while drinking a huge mug of coffee, when I came across news that the Breconshire Brewery is up for sale. I was lucky enough to visit said brewery just a few weeks ago when my best pal Sue took me there as a surprise, belated birthday present. It may come as a shock, and it’s certainly a bit of an anomaly for someone who loves beer so much, but I’d never been to a brewery before. My friend picked a good one for my first time and although I’d never been inside one I did at least know what to expect. It was a great lesson in beer for me though, with a charming and patient teacher in the shape of Head Brewer Buster Grant. I was a little perturbed at his invitation to taste the malt (the partly germinated barley which is one of beer’s primary ingredients), but as my friend was already happily munching away I popped a pinch in my mouth. It was a bit like a healthy, but tasty, breakfast cereal, or at least the pale one was. The darker ones had a different flavour and we weren’t even allowed to taste the darkest of all with Buster warning us it worked in the beer but would be disgusting to eat. After checking out the malt, it was downstairs to where the action is. Although I know that real ale is a craft product made by skilled brewers I didn’t appreciate, until Buster explained, just what a precise process brewing is. Get the temperature wrong in the mash (where the malt starch is turned into fermentable sugar and brewing gets underway) and “you might as well go home”, Buster told me. It was a fascinating insight into my favourite drink and as such the highlight of the tour was getting to taste the finished product. Now I understood why my friend had kept insisting that she would have to drive us on this surprise trip and that my car had to stay at home. We began with Brecon County Ale which had a hell of a lot of flavour for a 3.7% beer, not to mention that Buster offered his apologies that the warehouse being so cold might affect our tasting experience. But even at a tad too chilly I could detect a fruity, grass clipping aroma which somewhat belied its biscuitty, hoppy flavour. I could imagine myself putting a few pints of this away on an evening out with friends and from Sue’s reaction I could tell that she regretted that as designated driver she could only have a little sip! Next up was Golden Valley a refreshing golden beer with a good degree of carbonation, which I experienced as a pleasant little fizz. It had a really hoppy flavour, which came from a single variety (Progress). Finally I sampled Ramblers Ruin. I must confess that only having had a small breakfast before setting out meant this 5% ‘old ale’ pushed me over the edge into tipsydom, but I don’t think I disgraced myself. Too much. My beer book notes are certainly sensible and legible in any case. 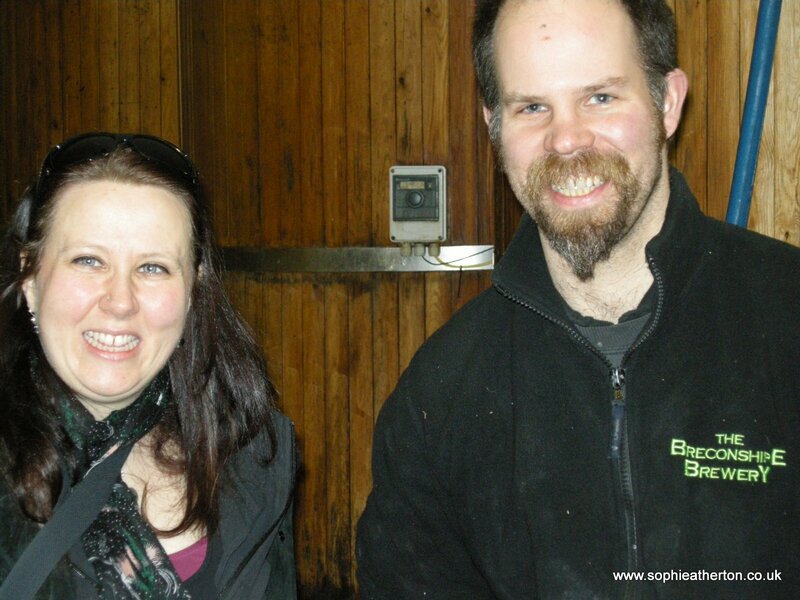 Me (looking tipsy after sampling Ramblers Ruin) and Buster. I’m not so much a fan of dark beers as I am of the lighter varieties, but Ramblers Ruin had a lovely toffee/caramel aroma and a sweet aftertaste which put it firmly on the list of beers to have again. Sue’s reaction was also a surprise. She loved it! If I’m trying to convert female friends to real ale I normally start them on something golden and summery, but I’d have done a better job with Sue if I’d suggested darker beers. Indeed, she took home some Really Wild Nut Brown Ale which sent her into raptures. She now has plans to attend the Brecon Farmers Market to stock up on more of Buster’s brews. As well as the pleasure of tasting the beer, Buster gave me a few tasting pointers and an important lesson. Never tell a brewer that his or her beer’s got a sort of, well, sour, quality to it. Whether you realise it or not, it’s not actually what you mean. If the brewer is a friendly one, and realises that you didn’t mean to insult the beer they’ve laboured so carefully to create, they will put you straight and at the same time introduce you to some of the terminology you are lacking. Fortunately for me, Buster fell into this category. I now know that what I had been describing as sour is more properly called ‘astringent’. If I had the cash, I’d snap this brewery up. It’s got great beers being made by not just a great brewer, but someone who’s a people person too. Here’s to the Breconshire Brewery; long may it continue. Thanks for an excellent write up! It was great to meet you. No changes yet in the brewery’s status, but life continues as usual. As and when there’s news, I’ll let you know.